Defense Minister says rocket fire by Syria show Assad's distress as his doom nears. Defense Minister Ehud Barak said on Monday that recent Syrian maneuvers that included missile launches were a sign that fear is gripping the regime of Bashar el-Assad. 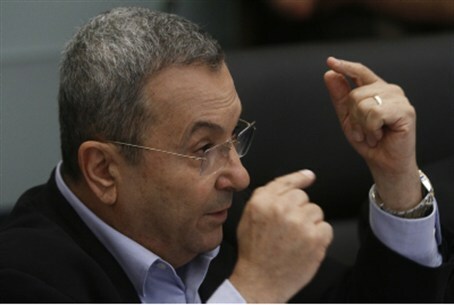 Barak, who was conducting a tour in the northern part of Israel, said: "We are here in the Golan Heights; right now it is quiet, but just a few days ago, only a few hundred kilometers northeast of here, we saw rockets of all kinds being launched. There may be more such displays of abilities, but this is an event that [stems] more from fear and distress than from confidence. "The Assad family is losing its grip and Bashar al-Assad is fated to fall from power. I do not know if it will take a few weeks or a few months, but there is no way back for this family, which is massacring its own countrymen, including in the past few days. "Assad's fall will be a serious blow to the radical axis, and will weaken Hizbullah in Lebanon, too." Regarding recent Katyusha fire at Israel, the minister said: "There are internal developments in Lebanon and we are following everything that takes place there. We had some Katyushas fired at us several days ago. It is not completely clear who fired them, but the element responsible in these days for everything that goes on there is, first and foremost, the government of Lebanon – and of course, Hizbullah."